An allergy is an extreme or overly sensitive response of the immune system to harmless substances in the environment. The immune system launches a complex series of actions against an irritating substance, referred to as an allergen. This immune response may be accompanied by a number of stressful symptoms, ranging from mild to severe to life-threatening. In rare cases, an allergic reaction leads to anaphylactic shock—a condition characterized by a sudden drop in blood pressure, difficulty in breathing, skin irritation, collapse, and possible death. The immune system may produce several chemical agents that cause allergic reactions. One example are the histamines released after exposure to an allergen. (Histamines are compounds that cause capillaries to dilate; smooth muscles to contract, thereby constricting airways; and gastric acids to be secreted.) The use of antihistamines helps to relieve some of the symptoms of allergy by blocking out histamine receptor sites in cells. The most common type of allergy is allergic rhinitis (inflammation of the mucous membrane of the nose) caused by inhaling allergens carried in the air. Seasonal environmental allergic rhinitis, or hay fever as it is popularly called, is brought on by wind-borne pollens, the dustlike masses of microscopic spores in seedbearing plants. Every spring, summer, and fall, pollens from grasses, trees, and weeds produce allergic reactions—like sneezing, runny nose, swollen nasal tissues, headaches, blocked sinuses, and watery, irritated eyes—in allergy-prone people. 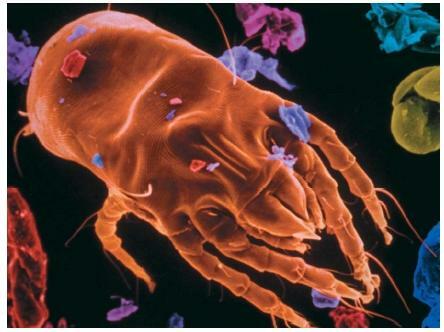 Perennial allergic rhinitis is the year-round occurrence of symptoms caused by inhaling allergens such as animal dander, molds, and dust from dust mites. Of the 46 million allergy sufferers in the United States, about 25 million have rhinitis. Allergen: An otherwise harmless substance that causes a fixed allergic response in certain people. Anaphylactic shock: A violent, sometimes fatal, response to an allergen after initial contact. Decongestant: Drug used for a short term to reduce mucous membrane congestion. Histamine: Chemical produced by the immune system that triggers allergic reactions. IgE: The chief antibody responsible for producing the compounds that cause allergic reactions. Lymphocyte: A white blood cell that stimulates antibody formation. Mast cell: A large cell in connective tissue containing substances involved in allergic reactions. Receptor sites: Places on cells where substances bind to produce certain reactions. Rhinitis: Nasal congestion, inflammation, and sneezing caused by seasonal pollens or other allergens. Steroids: Drugs that stimulate the adrenal glands (which in turn secrete hormones, or chemical messengers that regulate various bodily functions) and are highly effective in treating asthma and allergies but also have many side effects. Weal: A welt; the reddened, itchy swelling caused by a skin patch test. Other types of allergies can be traced to certain foods, drugs, insect bites, skin contact with chemical substances, and odors. In the United States there are about 12 million people who are allergic to a variety of chemicals. In some cases an allergic reaction to an insect sting or a drug can cause sudden death. Serious asthma attacks are associated with seasonal rhinitis and other allergies. About 9 million people in the United States suffer from asthma. (IgE). The IgE antibodies attach to mast cells, large cells in connective tissue that contain histamines and other chemicals. The second time any given allergen enters the body, it becomes attached to the newly formed, Y-shaped IgE antibodies. These antibodies, in turn, stimulate the mast cells to release their histamines and other anti-allergen chemicals. Studies show that allergy sufferers produce an excessive amount of IgE, indicating a hereditary factor in their allergic responses. How individuals adjust over time to allergens in their environment is also a factor in determining whether they will develop an allergic disorder. Anaphylaxis is a sudden, severe, sometimes fatal allergic reaction to a foreign substance or antigen. In humans, anaphylaxis is a rare event in which an initial exposure to a certain substance—such as penicillin, an insect sting, or certain foods—creates extreme sensitivity to it. The body reacts to the allergen by producing specific immunoglobulin E (IgE) antibodies that attach to the surface of mast cells containing histamine. On subsequent exposure to the allergen, the antigen binds with the specific IgE antibodies, triggering the immediate release of histamine and other irritating chemicals by the mast cells. The release of these chemicals cause hives, itching, nasal congestion, a sudden drop in blood pressure, shock, or loss of consciousness. Swelling of the upper respiratory tract may result in severe difficulty breathing, which can lead to death. Anaphylaxis must be treated immediately with an injection of adrenaline, followed by other medications. To prevent anaphylaxis, individuals with known sensitivities to certain substances are instructed to avoid exposure to them. Anaphylaxis kits are sometimes prescribed by doctors for patients who are hypersensitive to one or more antigens (a bee's sting, for instance). In the event of an emergency, the patients can inject themselves with adrenaline provided in the kit before getting to a doctor or hospital. Diagnosis of an allergic disorder is based primarily on the patient's medical history. Skin patch tests are sometimes used to determine exactly which allergens aggravate the patient's condition. A tiny amount of a suspected allergen is injected under the skin; any actual allergen will raise a weal at the site of the injection. The weal is a circular area of swelling that itches and is reddened. The size of the weal produced by a suspected allergen is compared to a "control" weal produced by the injection of histamine itself. The tests at times produce false positives, so they cannot be relied on exclusively. The simplest form of treatment is avoidance of the allergic substance. When that is not possible, desensitization to the allergen is sometimes attempted by exposing the patient to gradually increasing quantities of the allergen at regular intervals. Antihistamines, which are now prescribed and sold over the counter as an allergy remedy, were discovered in the 1940s. Antihistamines act by occupying the receptor sites in cells that react to histamine; histamine is therefore blocked from entering the sites. The allergens are still there, but the body's protective actions are suspended for the time the antihistamines are active. Antihistamines also constrict the smaller blood vessels and capillaries, thereby preventing the accumulation of excess nasal fluids. Steroid drugs inhaled through the nose are sometimes prescribed to allergy sufferers to relieve local inflammation. Decongestants can also bring relief but should only be taken for a short time, since their continued use can make the allergy-sufferer's reaction more intense.